1 of 6 Whisk nectar, vinegar, sugar, garlic, chutney, ginger, anise and salt in bowl. 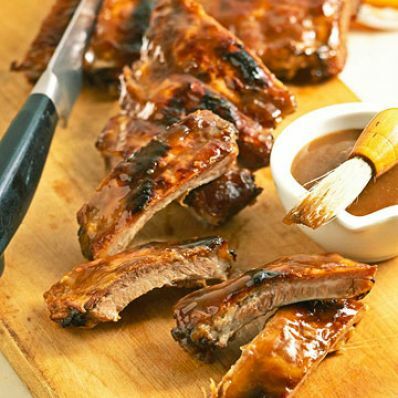 Place ribs in large plastic food-storage bag; add half of nectar mixture to ribs; reserve other half. Refrigerate ribs 1 hour to marinate. 2 of 6 Heat oven to 450 degrees F. Open foil bag; place on jelly-roll pan. Sprinkle flour on bottom of bag; add ribs, stacking, with marinade; discard plastic bag. Double fold foil bag to seal. 3 of 6 Roast ribs in 450 degree F oven 1-1/2 hours. Place reserved other half of nectar mixture in small saucepan. 4 of 6 Remove oven bag from oven. Increase oven temperature to broil. Carefully open bag, avoiding steam. Let ribs cool slightly; then remove to greased broiler-pan rack. 5 of 6 Pour drippings from bag into cup; skim fat. Add to nectar mixture in pan; whisk in cornstarch. Boil 3 minutes until clear, stirring. Remove from heat. Spoon some over ribs. 6 of 6 Broil ribs 1 inch from heat 5 minutes, until slightly crisped. Cut ribs apart. Serve with sauce on side. Makes 8 servings. 1 of 1 The butcher can cut these. Per Serving: 92 mg chol., 0 g fiber, 9 g sat. fat, 19 g pro., 362 kcal cal., 231 mg sodium, 23 g Fat, total, 20 g carb.